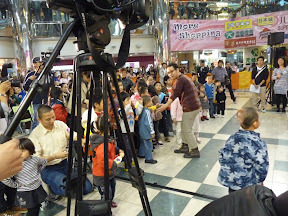 Day two is at another bigger mall in Hong Kong. There aren't any games as such like day one. Robots are dancing and the Japanese robots cheer up the kids with very creative dancing and with eyes popping performance. The kids are all running around happily and screaming as they get their Christmas gifts from the robots. I must say the Japanese dudes are very creative in keeping robots entertaining as well as giving them a distinctive personally. 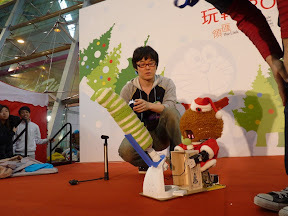 This is a picture of the Japanese dude preparing a rocket which will be launch by his robot to deliver a wonder gift to a lucky kid in the crowd. The man in the picture is keeping the eager kids at bay as they wait for the rocket launch. 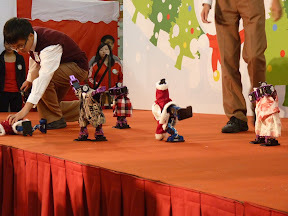 Here are robots from local school kids dancing. My robot dancing before it's arm came off as it doing hand stand! 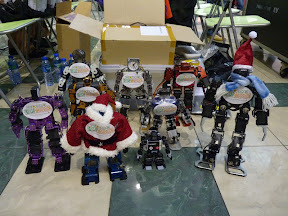 Here are some of the robots present on that day before the dances. 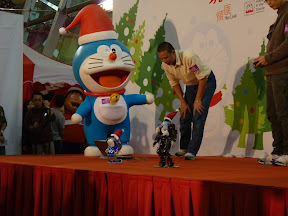 The purple one is a Chinese made robot. 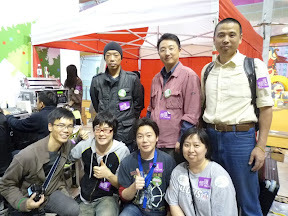 Here is a group photos with the Japanese dudes who are also the builder of the RoboOne champion "The Monster"